Though they’re from a city known more for Drive Like Jehu and Swing Kids, San Diego’s Solarminds speak to a past much further back than even cursory listens which suggest The Brian Jonestown Massacre or Swans or Spiritualized (or even Joy Division and Massive Attack, whom they were lodged between for their radio debut on Local 94.9 FM) at their mind-bending best. Solarminds are fundamentally ancient. This is ancient music. There are the obvious milemarkers for such an observation. Not to say that religion is outmoded, but the titles alone suggest something steeped in reverence with words like salvation, prayers, worshiping and so on. The mood has been established before you ever press play merely through their choice of song titles. For its part, the music goes a long way toward building an epic Gregorian chant kind of ambiance. “My Salvation (Drifting)” starts off innocently enough with what is either windchimes or bells ringing in a remarkable album in the most unremarkable of ways. Clearly, patience pays and Solarminds are in no mood to rush. Taking cues from their aforementioned influences, the band’s willingness to use standard instruments like heavily-effected guitars alongside a less standard instrument such as the harp allows them a great deal of freedom to roam throughout your headphones. They don’t make the listening easy. “My Salvation (A Way)” – one of six variations on the “My Salvation” theme – stretches some nine minutes long… And though its propulsion allows it to feel like significantly less time, the band’s careful conglomeration of sounds and unifying themes means that the whole first half of the album really functions more as one hyper-extended jam than as individual tracks. But what a jam it is. You’ll have to hit the MySpace to hear the whole thing in its opulent entirety. The vocals also evoke a Gregorian air in another, more basic way: The treatment of the vocals. Single syllables are stretched out in a grand melisma that would’ve impressed Gregory the Great himself. The pitch of the notes fluctuates wildly and it is clear that the lyrics play more as instrument than narrative. Voices are used sparingly and find themselves as texture more than talent (Instrumentals such as “Then Came the Night” and more airy spaces continue to dominate the second half of the album). This restraint has allowed a more unified album, a better togetherness. Yank Crime it ain’t. At its most base description, A Lighthouse for the Sun is a band in love with space-rock and shoegaze and post-rock and maybe a little noise-pop. But it’s also none of those things. It’s a record steeped in a history dating back hundreds of years and modernized to be put in terms of what the average music listener knows rather than what musicology students study. If Urck had a name for this album, perhaps it would’ve been this: Post-Religious Dream Music. Dare to dream, indeed. 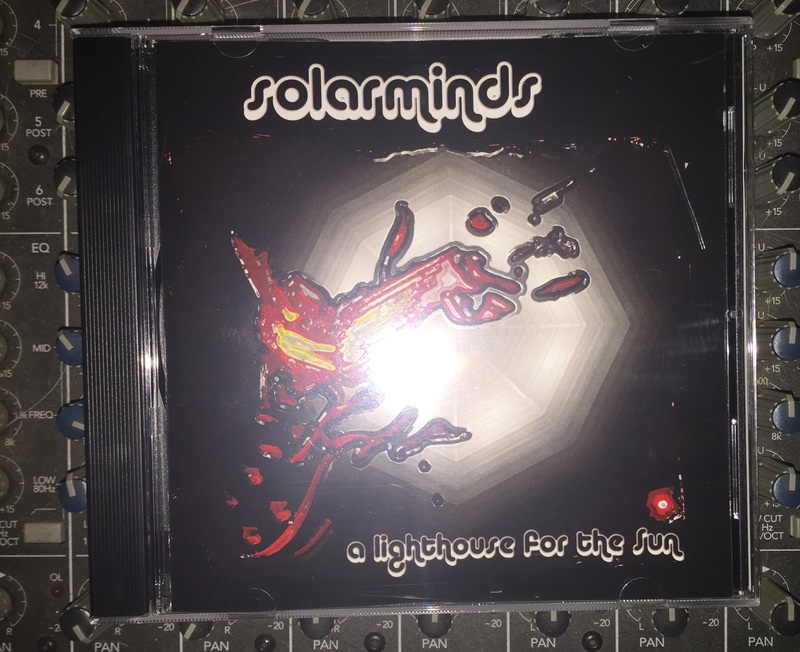 My first impression of this CD was “Great, just what I need: a Dark Side of the Moon knockoff.” Solarminds’ pace is a slow, determined one, and they incorporate an electronic filter or effect for every instrument and vocal. All of them. The combination results in wiggy atmospheric lounge music with haunting, far-off voices that seem to be shouted up from the bottom of a well. There are no clear delineations between songs; through slight alterations in the beat or variations in the chords, a new song is created from the foundation laid by the track before it. The lyrics are heady and repetitive, associated with shadows, rain, the sun, and the mind…as well as torture and life. It’s conceptual audio art, and it’s not for everyone. By track four, I’m impressed. No instrument misses a chord or beat. Even though it’s oddball stuff, it’s well played, relaxing, and forces contemplation, which seems to be Solarminds’ intended goal. While I would not want to sit in a bar while the band reverbed their instruments and whined through megaphones, I wouldn’t mind having the album lying around in case a buddy of mine scored some mushrooms and my Netflix movies included the entire run of that goofball TV show from the ’70s, Land of the Lost. Just for the weirdness of it.